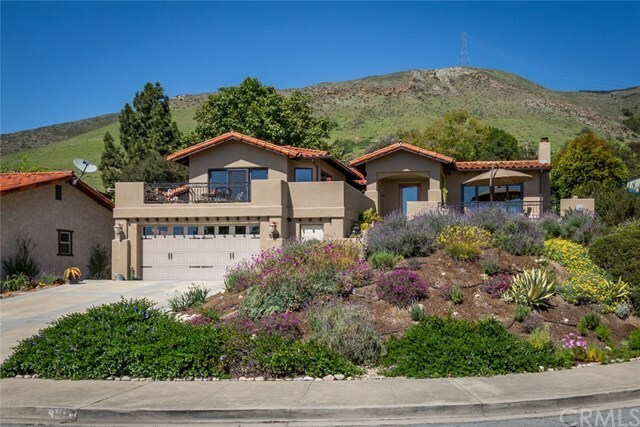 Stunning three bedroom, three bath home with exceptional views in one of San Luis Obispo's most desirable neighborhoods! Extensive renovations have included a family room addition, new 3/4 bath with large walk-in shower and door leading out to the hot tub, new concrete patios, new wood plank and beam ceilings, and air conditioning. This is indoor/outdoor living at its finest with views from most windows, patios off the living and family rooms, and extensive landscaping and hardscape. Travertine tile and new engineered wide plank wood floors throughout. Gourmet kitchen with beautiful knotty alder cabinets, granite countertops, large island and extra wine and beverage refrigerators. Spacious master bedroom with amazing views, french doors out onto a newly resurfaced deck, and large bathroom with walk-in closets and separate tub and shower. Mostly single level, open floorplan, and quiet cul-de-sac location. Information not verified.